Japanese Episode DP 148: "Muma and Yamikarasu and the Dark Stone!" American Episode 1243: "Trying for the Family Stone!" On their way to Nagisa City, Satoshi and his friends meet a girl named Ltyl. She explains that her brother, Mytyl, has been using his Yamikarasu to cause problems for other people. So, she wants to find the Dark Stone so she can evolve her Muma into a Mumage and have it cast a magic spell to bring them both happiness. Satoshi and his friends decide to split up and help Ltyl look for the stone. 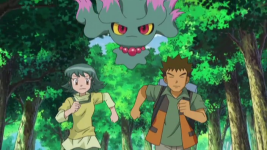 During Satoshi's and Hikari's search, they come across Mytyl and discover that his Yamikarasu was acting of its own volition because it had been fed up with its trainer's careless exercises. Meanwhile, Takeshi and Ltyl stumble across the Dark Stone. Suddenly, the Rocket-Dan appear in their giant Poppo mecha and take both the Dark Stone and Ltyl's Muma! Takeshi's Usokki is called out to take care of the mecha, but the rock-type pokemon is no match for the mecha's attacks. Ltyl grabs ahold of the robot just as it takes off and tries to pry the stone from the robot's claws. Mytyl and the others arrive just in time to see Ltyl's selfless act and call on their pokemon to help her. After Ltyl, the Dark Stone, and Muma are saved, Pikachu destroys the mecha with its Thunderbolt attack. Later, Mytyl and Ltyl make up and conclude that they don't need Mumage's spell to bring them together anymore. Now that the siblings' fighting has come to an end, Satoshi and his friends continue on the path to Nagisa City. We've had too many good episodes lately, apparently. So, we get this boring episode to make up for it. This episode will not go down as one of the most memorable episodes in Diamond & Pearl. The conflict isn't all that interesting, the pokemon don't really do much, it's not overly comedic, and nothing happens to prevent it from becoming the dreaded f-word. I guess it's kind of neat that they could get in some more HeartGold and SoulSilver promotion by showing off two Jouto pokemon who can, conveniently, both evolve into a Shin'ou pokemon by using the same stone. But the show was such a by-the-numbers affair that it's hard to pat it on the back even for that. The animation's nice and the backgrounds are gorgeous, but it's kind of a hollow victory when you consider the fact that you have to sit through such a bland episode in order to see them. The one saving grace, for me, would be the Rocket-Dan's mecha. I love it whenever the Rocket-Dan does that "pokemon attacks that aren't really pokemon attacks" thing, and seeing Takeshi's Usokki get defeated by such ridiculous techniques was a real treat. Also, it's pretty awesome seeing Takeshi in the spotlight again for a change. Proactive Takeshi makes me happy, for some reason. This episode is basically an homage to the play L'Oiseau Bleu ("The Blue Bird") by Belgian playwright Maurice Maeterlinck. The story is about two siblings, Mytyl and Tyltyl (ミチル and チルチル in the Japanese translation) who are tasked with finding the "blue bird of happiness." In Japan, they made an animated series and a live action drama, so it's not unheard of over in the Land of the Rising Sun. Meanwhile, in this Pocket Monsters Diamond & Pearl episode, we have two siblings, Mytyl and Ltyl (the former removing the Ty- from her model's name), trying to find a spell to bring them happiness. Later on in the episode, the Rocket-Dan have a mecha known as the Happy Blue Mecha in the Japanese version, an obvious reference to the play's titular character. This play is also where the romanizations Tyltto (Swablu) and Tyltalis (Altaria) most likely come from. The English version continues to be the English dub, for better or for worse. There's far too much dub music here for my liking and Team Rocket was more annoying than they usually are, but what can you do at this point? Giratina keeps its Japanese voice. TPCI didn't really catch the whole L'Oiseau Bleu thing, so the references made to it in the Rocket-Dan's motto got ignored. Musashi: "Chotto! Anata-tachi wa dare ccha? no koe o kiki"
Kojirou: "Shiawase motomete yatte kita"
Musashi: "Doko ni aru no ka tougenkyou?" Kojirou: "Kono te ni tsukamou happii raifu"
Musashi: "Koufuku ka fukou ka erabe to ieba"
Kojirou: "Daremo ga naritai shiawase mono!" Musashi: "When we hear a voice saying "Wait! Who the heck are you guys?"" Kojirou: "We pull together all our happiness and show up." Musashi: "Where is it, this fairyland?" Kojirou: "Let's take a hold of this happy life"
Musashi: "Whether you choose happiness or unhappiness,"
Kojirou: "Anyone would want to be a happy person!" Musashi: "We are the ones searching for happiness!!" Kojirou: "We are the forward-looking"
There are a few things to note here. When Kojirou delivers his second line ("Happy! "), he's wearing a traditional style of Japanese coat known as a happi (法被). The coat itself doesn't have any real connections to happiness other than being a homophone with the word "happy," but it's a reference that probably flew over most Westerners' heads. The second thing to note is Nyasu's first line, which is an obvious reference to the L'Oiseau Bleu. The last thing worth mentioning is Musashi's next line, the one where she asks where fairyland is. "Fairyland" is a reference to the good fairy in Maeterlinck's play, Bérylune, who tells the children about the blue bird of happiness. The dubbed version tries to keep the same tone, but they leave out all the references to L'Oiseau Bleu. Jessie: "We're out of this world, can't you tell by our suave demeanor?" James: "Our grass is always greener!" Jessie: "Happy searching at a breakneck pace." James: "Dashing hope, with a smile on my face." Jessie: "Joy by any other name's just as happy." James: "While you twerps are so sappy." Jessie: "Putting the do-gooders in their place." Team Rocket: "In your face!" Finally, the aforementioned "Happy Blue Mecha" gets renamed the "Porta-Pidgey Mach Two" for the dub.